Tiger Rush is a video slot game created by Thunderkick. The slot features 5-reel along with 3 rows and 10 paylines are fixed. These paylines, however, may extend up to 25 paylines. Tiger Rush operates from both ways, which means reels realize from both left and right side. This is something which is usually observed with Thunderkick games. Tiger Rush has a safari like set up which tries to exact an innovative game. However, this game is nothing out of the ordinary. As you go along this review, you will realize the plainness of this game. The backdrop is a bright side of the game as it is Chinese style drawing of a Tiger. Tiger Rush is a safari-themed game which features a humongous Chinese drawn tiger as the protagonist. To play the game, players can place their wagers between €0.10 and €100 per spin. Along with that, the min size of the coin which can be waged is 0.1 and it can go as high as 100. Having mentioned all the basics, let’s discuss the RTP. The Return to Player factor of this game is 96.3%. In my opinion, the RTP is low and can definitely be improved upon. The game has the maximum win of 1750x more than the player’s wager. All of this seems very ordinary and Thunderkick can definitely add more to these aspects of the game. Tiger Rush, as mentioned above, is a safari jungle themed slot game. So, all the symbols are resonating with this theme. So, Tiger Rush comes with a total of 7 regular icons or symbols. Out of these 7, 2 are premium symbols. The symbols which are of low value resemble jelly beans, and the ones with a more premium effect resemble Asian art. Some symbols hold a much larger value than the rest. For instance, the most important symbol is that of a silver bird which has an orange backdrop. This symbol has a worth of 15 times more than the stake if appeared in a pair of 5 at a time. The Tiger in the reel represents the most lucrative factor which is that of a wild symbol. The tiger symbol only appears in the middle of the reel. When the tiger appears he expands across the entire reel and gives the players 1 re-spin. You will read about such bonuses of Tiger Rush later in this review. Tiger Wild: The tiger symbol is the main deal of the game. Hence, the tiger symbol acts as a wild symbol in the reel. The trigger wild symbol appears only on the 2nd/3rd/4th reel. But when it does occur on the reel, it covers the entire space. Triggering of the wild will result in one free spin, which is very less. 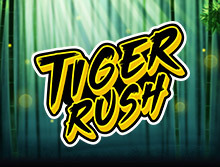 Free Spins: Tiger Rush features a free spin feature for its players. To land the free spin, players need to trigger the scatter symbol of Tiger Rush. The scatter of the game only appears on the 1st/5th reel. To trigger this, players need to wait for the scatter symbol to land in a pair or land adjacent to a wild symbol. Either of these combinations will render you 5 free spins in the game. This again is not a lot considering the other games of Thunderkick. You really need to luck out to get 20 free spins in this game. The structure of this game is such that, the reel appears completely stacked almost all the time. This makes it easy to trigger a full reel filled with premium symbols which are top paying. This can happen without the need for a wild reel. So when this triggers, you can get a win which will be 150 times more than your wager. For some, it may not seem much. But given the game’s lack of bonuses, this is an improvement. Thunderkick, whose reputation is known for kickass video slots has really let is down this time. The game seemed unimaginative with really low payouts and an even lower RTP. The game has low variance if that is any consolation. However, even with that, the game just fails to impress. Some points to discuss are that the game has slightly better graphics and a good backdrop. This makes the game easy on the eyes. However, the bonuses are just too little and they trigger in an even slower and sloth-like manner. When we ran the reel, after the 10th spin we could land a menial bonus.